Nearly two decades ago, Faithful Homes began by providing care for adults with developmental and intellectual disabilities in need of respite care. Since then, the company has grown and now provides residential and homemaker personal care for these individuals, in addition to non-medical transportation and travel services, helping them become more involved in activities they enjoy in the community. 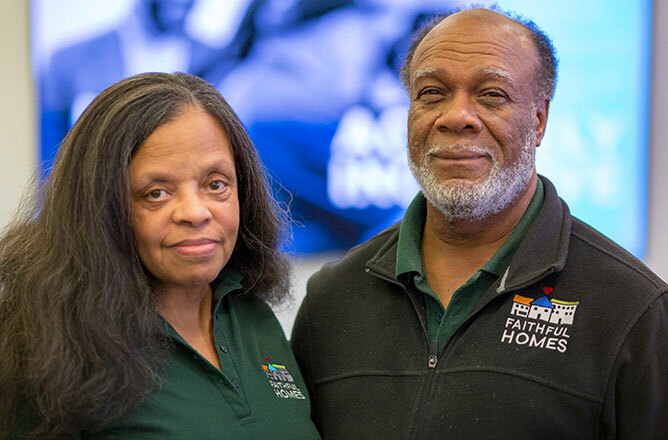 Company founders Karla and Carl Miller are also a part of JumpStart’s Core City: Cleveland Impact Program, an intensive business assistance program designed to support the development and growth of businesses located within Cleveland’s core neighborhoods. We recently sat down with the duo to discuss their business, and how the Impact Program has helped them grow as entrepreneurs. Karla: A friend of mine actually insisted that I start this business, and I’m very glad she did. We saw the need for good residential care and transportation options for people with disabilities. And by good, we mean more than just a service, it’s getting to know these people and what they like and don’t like. We provide more than just a ride. These are not just clients to us. We invest in their lives by taking an interest in them. We talk to them, get to know them and help them know what else is available to them in the area so they can be involved in our community. Carl: Our daughter has been involved with Core City and she challenged us to participate and told us it would help us better our business. Karla: At first, I thought this was something I would never do. My fear was standing up in front of people and talking. I realize now how much this program is helping me to know my business better and be able to speak impromptu about the business. Karla: I continue to be impressed with the type of assistance and the enthusiasm everyone shows about offering it. It has helped us grow personally and professionally. I am amazed by the knowledge of business that my advisors Ashley and Hardik have, and how much everyone encourages us. Carl: I know her goal has been to grow this into a million-dollar-plus business. Karla: That was definitely one of my initial goals. But I’ve also realized we might have been limited ourselves by setting that as our only goal. So I think what we really want to do is continue providing quality service to our community, grow into other communities and see where that takes us in the future. As our business becomes more successful, I also know that one of Carl’s goals is to get off the road driving and get on the golf course more driving balls. And I would love for us to be able to spend more time with our families. We’ve raised 10 children and some of them have children now, so we’d love to be able to spend more time with them. Learn more about Faithful Homes, LLC at faithfulhomes.biz. Then, come watch Karla and Carl pitch their business live on December 5 for a chance to win up to $10,000 at the Core City Cleveland Entrepreneur Showcase.